RAS LANUF, Libya — Forces loyal to Col. Muammar el-Qaddafi retook this strategic refinery town after an assault by land, air and sea Thursday, opposition leaders and fighters said, an onslaught that sent scores of rebels fleeing along a coastal road and underlined a decisive shift in momentum in an uprising that has shaken the Libyan leader’s four decades of rule….The apparent government victory capped several days of fighting as the rebels’ bold plans of a westward drive to Tripoli were dashed by the superior Qaddafi forces, which are seeking to retake several eastern oil cities that had slipped from the government’s control in the first days of the uprising. Under a steadily escalating barrage, rebel fighters in dozens of trucks mounted with heavy weapons retreated east along the coastal road. In a chaotic scene at a checkpoint five miles east of town, fighters shot anti-aircraft guns randomly and ineffectually into the sky while arguing whether to flee or to try to establish a new defensive front. 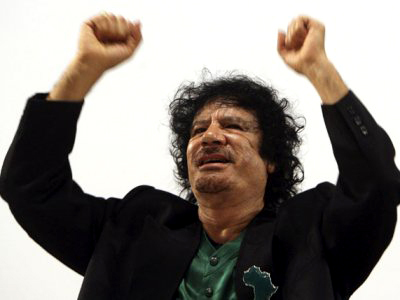 Would a no-fly zone hamper Qaddafi enough to give the rebels a chance? Maybe, but I wouldn’t count on it. And if it didn’t work, what would be next? Ground troops? I’d like to see the end of Qaddafi’s rule. Who wouldn’t? But Americans really need to get over the idea that we’re the ones who control the fate of every hot spot in the world. We’re not. If we can agree with NATO or the UN to create a no-fly zone, or if we can safely supply the rebels with arms, I’m all for it. What I’m afraid of, though, is that the John McCains of the world will never be willing to stop there if that’s not enough. So before President Obama agrees to do any of this, McCain and his national greatness buddies need to be clear up front just how far they want to go, and they need to be willing to stick to that even if it doesn’t work. Being sucked into an ever escalating civil war in Libya isn’t something any sane person should wish on us.